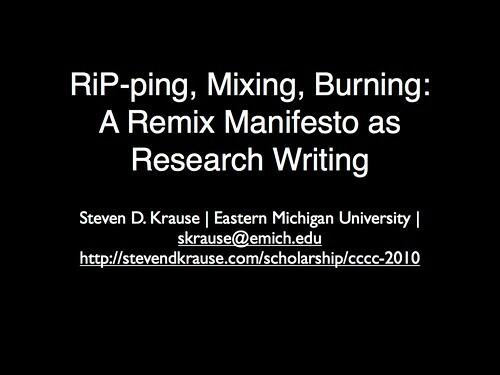 This is the web site/blog version of my presentation at the 2010 Conference for College Composition and Communication in Louisville, Kentucky. 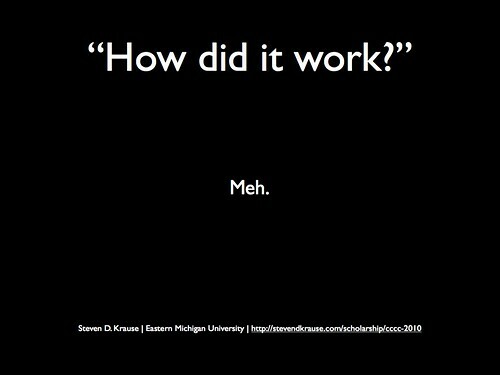 What I include here are my slides and my notes. 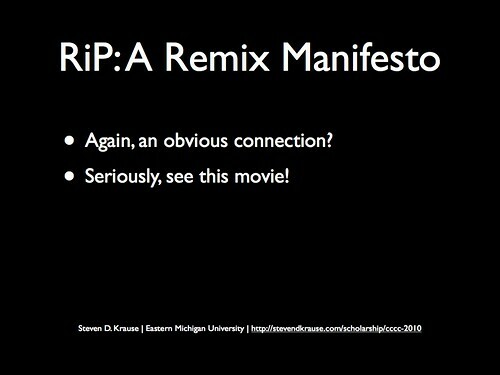 Links to various things I mention in my face-to-face talk; most useful (I think) are the links to information on how to watch RiP: A Remix Manifesto on line and/or for free, and also the information about the sections of first writing where I introduced these various assignments. Krause’s English 121 Spring 2009 was a wetpaint site for the spring term (e.g., one of the short summer sessions at EMU). The “Portfolio Assignments” page leads to descriptions of all the portfolio assignments; the “student pages” link opens up more links to the student pages within the site where they posted their exercises and portfolio essays. For fall 2009, I moved to this different wiki space (media wiki) and I adjusted some of the assignments a bit. The premise is the same though. Here’s a link to the portfolio assignments, and here’s a link to the student pages. To get things started, I’m going to “show” quite a bit, for two reasons. First, I’m assuming that most of you haven’t seen this movie, and showing some clips seems both useful and entertaining. And second, I’m a fan, and if I accomplish nothing else with this presentation, I want to encourage you to make the effort to see see the movie. Then I’ll do a little telling about how this film figured into my first year writing classes last year. Finally, I’ll briefly talk about the results, which raised questions for me once again about the challenges of connecting things not traditionally seen by students as being a logical part of a writing class. 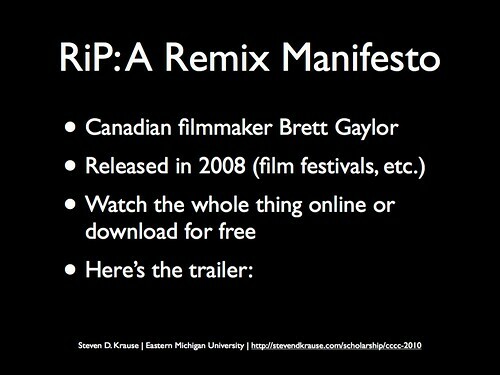 RiP: A Remix Manifesto is a documentary made by Canadian filmmaker Brett Gaylor which explores authorship, ownership, and copyright in the age of the Internet, focusing mostly on remix culture, particularly with music. It was released in 2008, mostly at film festivals, and it is available now online, either for a download where you choose your own price, via Hulu, sites like iTunes, and so forth. Just get things started, let’s take a look at the trailer. 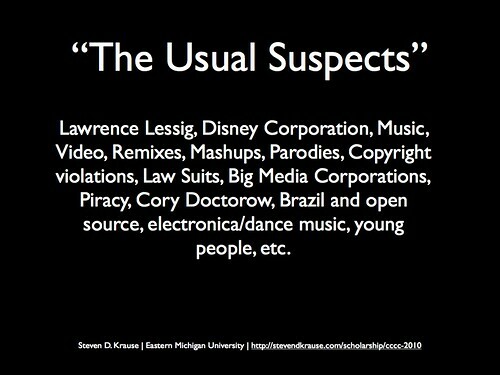 That clip gives you a sense of the topics covered– pretty much everything you would get if you did a google search for “remix culture” or “copyright violations.” In some ways, I think this makes for an uneven film, but it’s nonetheless entertaining and high-energy, not to mention informative. and mostly as it relates to what I would describe as the “main character” of the movie, the mashup performer Girl Talk. Here’s a clip from the beginning of the film, after Gaylor has introduced us a bit to his own history and what he frames as the “war” for ideas with copyright/copyleft, especially as it relates to the Internet, remixing, tagging, Corporate ownership of ideas, etc. Three things I’ll mention here: Girl Talk is the stage name of Greg Gillis, the woman in the bed behind him (we learn later in the film) is his girlfriend, and, if you couldn’t already guess, that’s Brett Gaylor talking to Marybeth Peters. I’m assuming a bunch of academics see the connections with what Girl Talk is talking about and what we try to address directly and indirectly in our teaching. But Gaylor talks about these issues well beyond music. Here’s one last clip that I’ll show. 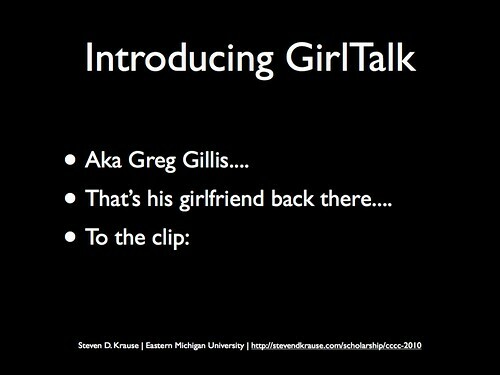 It comes toward the end, and it features Girl Talk– now really as the biomedical engineer Greg Gillis– talking about how these issues are connected to his work. Again, the connection is obvious, right? I’ll get to that more in a moment, but before I forget, let me again emphasize one of my main points and goals with this presentation: go see the movie. There’s so much more here– about the Disney Liberation Front, about lawsuits by the RIAA, about how the U.S. arguably made a “deal with the devil” for looking the other way on China’s copyright violations in exchange for cheap imports, about Radiohead, about Brazilian remix culture, and on and on and on. Watch the movie, you’ll be glad you did. 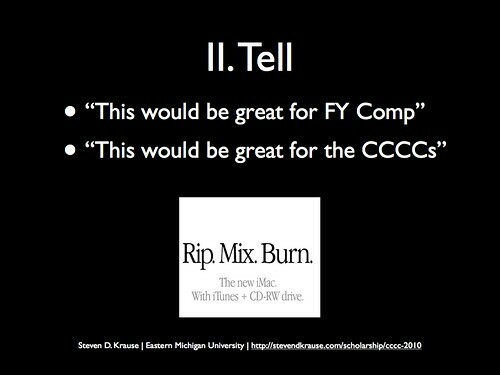 Now, tell: I first saw RiP a year ago, and I simultaneously thought “this would be a great way to frame a section of first year composition,” and “this would make for a great talk at the CCCCs” since I knew the theme for this conference was “remix.” Frankly, this is probably the first time I’ve ever presented at this conference where my talk actually fits the official call for presentations. So I put together the sections of first year writing I ended up teaching last year based on this theme, one in the shorter spring term and one in the regular fall term. The theme or metaphor for my class was “Rip, Mix, Burn,” building off of both Gaylor’s film and the well-known Apple iPod campaign from a number of years ago. Basically, I broke the class into three portfolios with a series of exercises. I only have time here to summarize them, but all of the activities and much of the student work, which was posted online in wikis, are linked to the web site I have for the presentation. The “Rip” portfolio was designed as a way for students to come up with a topic and to begin to gather and examine the research they would work with throughout the term. This was the most traditional unit of the class, and the exercises included a topic proposal assignment, a critique assignment, the first part of an annotated bibliography assignment, and a portfolio essay where students were asked to reflect on this process. The “”Mix” portfolio was the most unusual and most influenced by Gaylor’s film and remix culture. The goal with this portfolio was for students to re-see, revisit, and, well, remix the research that they had gathered to better learn about their topic. I began this unit by screening RiP, so the points of comparison and analogy between remixing music to make something new and remixing research to make a new point were fresh. The assignments in this unit began with the second part of the annotated bibliography, which essentially extended the research students were conducting. 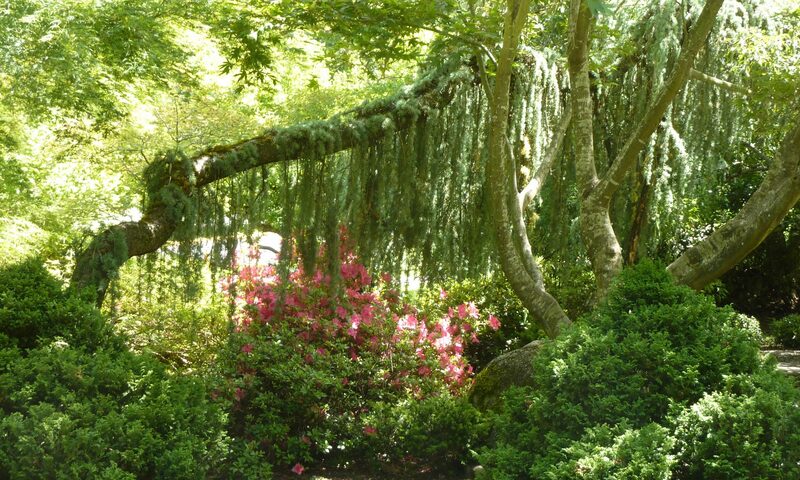 The next assignment was the “antithesis,” which asks students to consider the antithetical views– either the opposite or alternatives– to their own working thesis. The next assignment was the “mashup” exercise, where students were to write briefly– 300 or so words– using direct quotes from their research, of course citing each of these quotes. Other than various minor parts of speech, all of the text was “borrowed” (remixed) from other sources. The fourth was the “inventory/mapping” exercise. Basically, the assignment asked students to assess and categorize their evidence on a chart– literally creating a visual reference with categories of evidence in columns and particular examples of evidences in rows– and then to write about what this activity has taught them about the evidence that they gathered. And again, this portfolio unit concluded with a reflective essay. 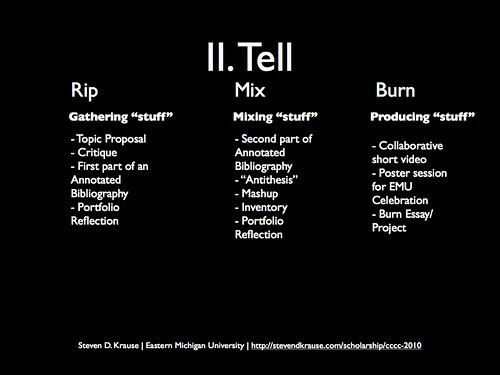 The idea of the last portfolio unit, the “Burn,” was for students to produce research designed to exit the class. In other words, while the first two portfolios were meant for an internal audience of fellow students and me, the purpose of the “burn” portfolio was to present their research for a real and external audience. 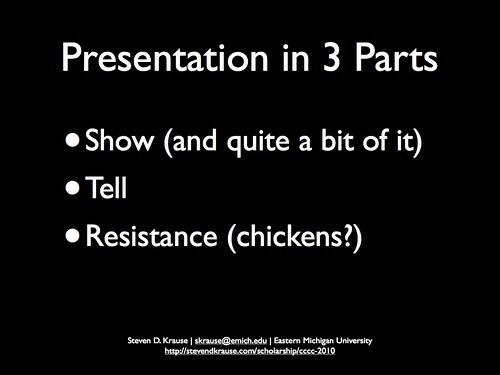 The activities here included a collaborative short video where each student in a small group did something to introduce their research to an external audience– that in and of itself is probably its own presentation, frankly– a poster presentation for the EMU annual celebration of student writing, and the “final burn” essay, in which students were asked to write an essay (or its equivalent) to a particular and specific audience which could potentially be persuaded toward the argument they were trying to make with their research. So, how did it work, how did this all turn out? Eh, it was okay. Don’t get me wrong– I personally found it intellectually interesting and a good way about teaching this class, and I’ll do something similar the next time I teach first year writing. I did see most of my students develop and think about their research as the term went on, and I do think that for many of my students– particularly the brighter students– did take away more from this somewhat unorthodox approach than they would have from your standard, current-traditional “write a research paper” kind of class. Though this is all more a “gut feeling” than it is a real conclusion. 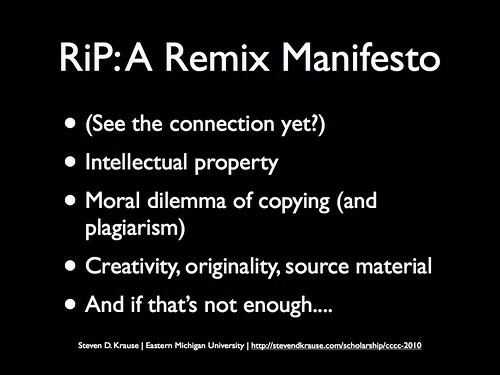 offering some guesses as to why as many students resisted this approach, and what I think this means in very general terms about how we should approach incorporating new media, remixes, and other unfamiliar approaches in writing classes, particularly first year writing classes. First, despite the notion that incorporating new media/popular culture like movies, music, and more into our classes is a good idea because it is what the “kids today” are into and this is the “digital native” world they know, I once again found in my students a surprising amount of ignorance and apathy. And I found this especially among my “true freshman” students, as opposed to the sophomores, juniors and seniors who found their way into first year composition for various reasons. I’m not entirely sure what the cause of this ignorance and apathy about what should be their contemporary culture is all about, but it certainly seemed to be there. 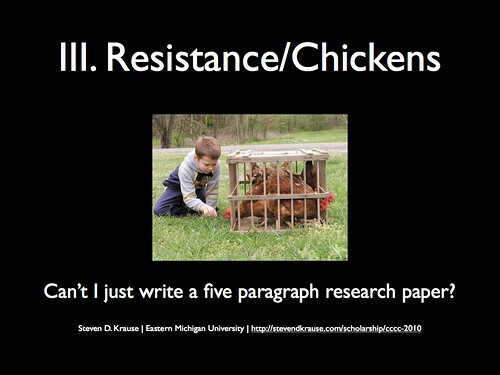 Finally, and this is where the chickens thing comes from, I think that students are often very leery of leaving the confines of the cages of convention that they have been raised in. 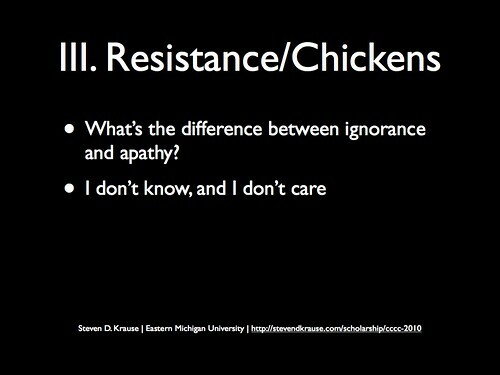 As I understand it, even when so-called “free-range” chickens are raised in humane conditions (and they often are not, of course), they are reluctant to leave their cages and certainly not their source of easily obtained food. They are, after all, domesticated animals. 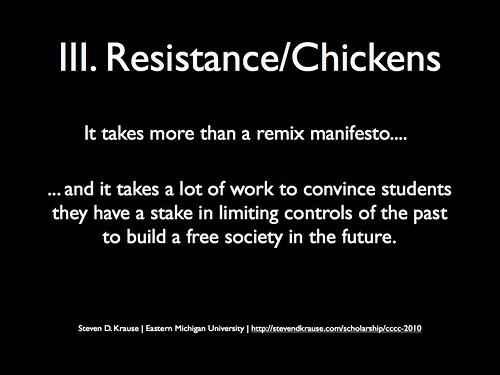 I think that a lot of students are in this sense “chicken:” too scared and too dependent on an educational system designed to domesticate them to think outside of “the box” even when the assignment explicitly asks them to do so. In fact, after going through all of the cage-breaking tricks I tried throw at them with these exercises, a disappointing number of them retreated to the old and stale school genre they are most familiar with. And that’s chicken chicken chicken chicken. In other words, remixes and manifestos are a good start. 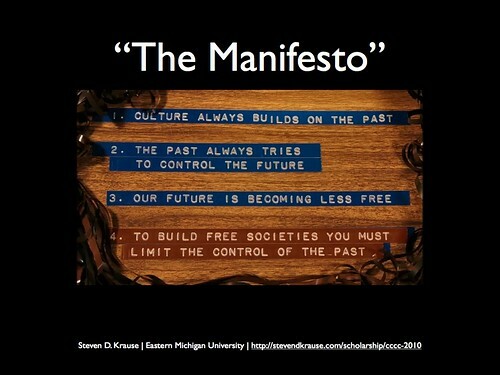 But if we are going to realize Gaylor’s manifesto, it’s going to take a lot more than that to get students away from the controls of their pasts to build a free society in the future. All this sounds great Steve. I would love to see it in action. I do think there is a connective metaphor — actually it’s more than a metaphor — between remix culture, what we do with sources, and what we do with thought, when we write. 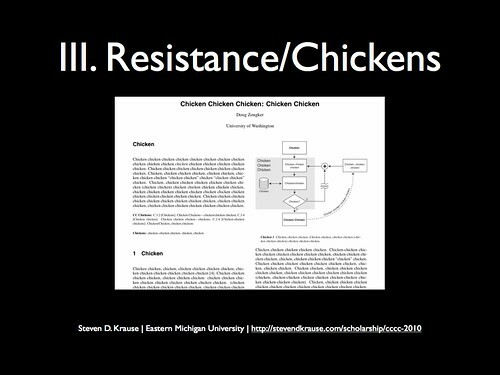 Also, what you say about students’ reaction to this approach, their resistance to creative/metaphoric thinking is pretty close to the truth; however, I probably wouldn’t refer to students as “chickens,” domesticated animals (even if I really thought so:-P). 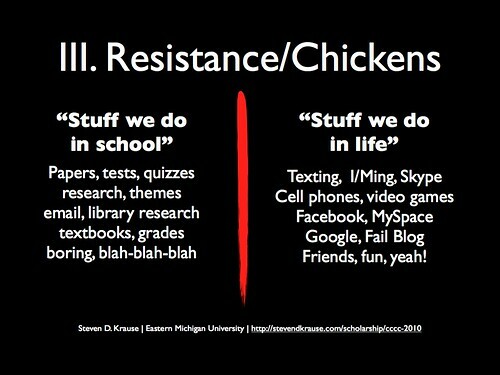 I like what you say here: “I think that a lot of students are in this sense “chicken:” too scared and too dependent on an educational system designed to domesticate them to think outside of “the box” even when the assignment explicitly asks them to do so.” What I think you’re getting at, in one respect, is how little “traditional” education values creative thinking. Students who grow go through our high schools, generally, learn to think creativity/imagination is something to do outside of school, as you somewhat suggest. This has obvious problems when what we want students to do with sources in their papers is to use them creatively, to make something new out of something old. Anyway, just some thoughts, have fun presenting!